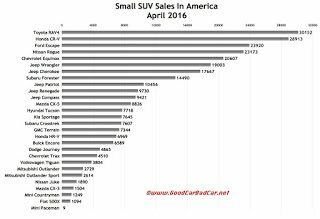 Despite a handful of mostly domestic exceptions, U.S. sales of small SUVs and crossovers jumped 16% in April 2016. 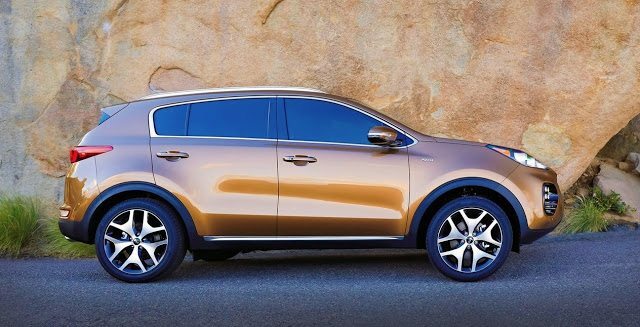 The significant uptick was powered largely by the Toyota RAV4, Hyundai-Kia, and Jeep’s soon-to-expire models. The RAV4’s place at the top of the small SUV/crossover heap was secured for a sixth consecutive month. U.S. sales of Toyota’s third-best-selling model jumped 32%, a gain of 7238 sales, to 30,152 units in April 2016. The RAV4’s next-best-selling rival, Honda’s CR-V, slid modestly to 28,913 sales. Through the first one-third of 2016, the RAV4 leads the CR-V by 6173 units, not an insurmountable figure for the Honda which has led this category – and the whole SUV/crossover sector – in four consecutive years. Subcompact crossovers which weren’t available at this stage of 2015 added 9567 sales to their segment’s April 2016 sales total. The Fiat 500X, Honda HR-V, and Mazda CX-3 produced 22% of the segment’s sales. 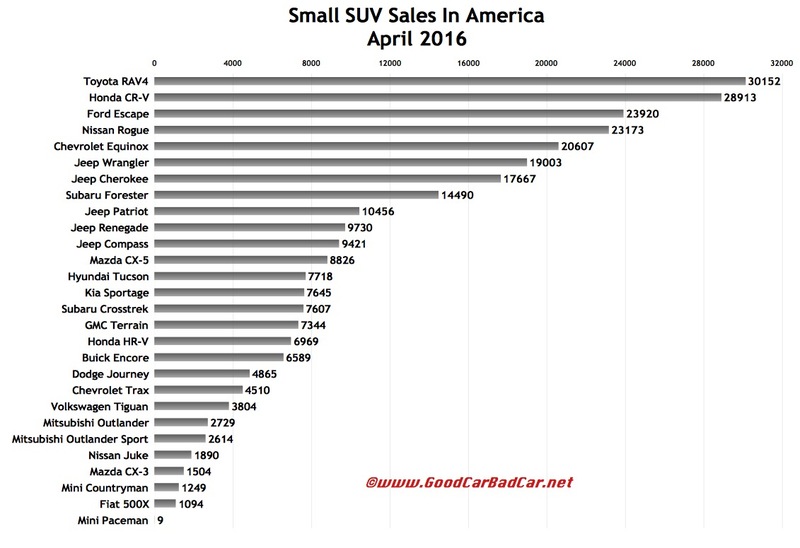 Leading the pack in April, and through the first four months of 2016, was the Jeep Renegade. With 9730 sales last month, April 2016 now stands as the highest-volume month yet for the Renegade. For the third-ranked Honda HR-V, sales rose to the highest level since the nameplate’s first full month of June 2015. You can click any model name in the tables below to find historical monthly and yearly U.S. auto sales data. You can also select a make and model at GCBC’s Sales Stats page. These tables are sortable, so you can rank small SUVs and crossovers any which way you like. Suggestions on how GCBC should break down segments can be passed on through the Contact page. GCBC isn’t here to break down segments, an impossible task for any group, but to display sales data for the sake of comparison. The more ways sales data can be displayed, the better. This explains why you’ll see the Encore and XV Crosstrek are listed with small cars, too, and the pricey FJ Cruiser and Xterra with midsizers, as well… because readers have wanted it both ways. You can always find the sales results for EVERY vehicle and form your own competitive sets by using the All Vehicle Rankings posts.